The proposed chapter aims to provide a discussion on the issue of the utilization of wireless technologies, for the deployment of monitoring wireless personal area sensor networks for the unobtrusive monitoring of patients. 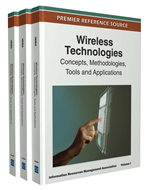 The chapter aims to answer some of the fundamental questions raised by this, including which is the most appropriate technology for such a networking architecture, what is the best topology for home monitoring wireless sensor network solutions, and what is the performance of the wireless networking technologies. In addition, it aims to initiate some brainstorming as regards how many interoperability protocols we actually need, presenting the strong and weak points of most of the current interoperability standards utilized in the field of homecare, with emphasis on the encoding and formatting of ElectroCardioGram (ECG) waveforms. Last but not least it aims to pinpoint other important issues in the field of homecare, such as legal and safety issues which are worth of consideration. eHealth is a term that was introduced around the year 2000, to act as an umbrella term for all Information and Communication Technology (ICT) enabled healthcare applications. One area that has greatly advanced during the last few years due to the ever-increasing advancement of ICT is that of telemedicine, whether it concerns emergency scenarios (i.e. ambulatory care during transportation of a patient from an accident scene to a hospital), teleconsultation scenarios (i.e. advice delivered remotely from experts situated at a central hospital to non-specialised medical personnel at a remote healthcare center) or home healthcare and rehabilitation scenarios (i.e. post-operative monitoring of patient critical parameters). Along with the advancement of ICT, came the provision for prognosis and early identification of diseases and stability worsening. The new concept is to proactively monitor patients in order to prevent their status deterioration, rather than treat diseases. This has further advanced the need for home monitoring, especially for elderly patients, as well as for patients with chronic diseases, and patients who have only recently been discharged from a hospital environment. Nevertheless, this new healthcare provision model has raised several issues and needs, one of the most important of which is the patient comfort; in order for patients to be e-included and accept the new bouquet of healthcare services, they actually need to feel as if-at-home; this applies not only to elderly patients who are not that familiarized with the technological advancements, but to all patients who feel that their privacy is being violated. This need has led to the utilization of wireless technologies, for unobtrusive monitoring of patients, discarding cables that remind of hospital environments. However, does the utilization of wireless technologies constitute a panacea for home monitoring? Does the deployment of wireless sensor networks resolve all issues, or does it perhaps raise new, important issues, especially as regards the field of healthcare provision, which is by itself a very subtle and tricky one? Which is the most appropriate technology and what is the best topology for home monitoring wireless sensor network solutions? What is the performance of the wireless networking technologies, given the fact that most of them operate in the 2.4 GHz Industrial-Scientific-Medical (ISM) band? In addition, a second crucial issue that has been raised as regards home monitoring is that of standardization and interoperability between medical devices, or between devices and hospital information systems. The expansive use of telemedicine in areas of medicine where digital recordings are made, is based on the assumption that the receiver of the data can view and process the data. At present this is only possible between laboratories which use the equipment of the same manufacturer or some agreed interchange format which has required programming skills in order to make the conversion programs. Medical technology has developed in the context of rapid advances in the science of information technology and has benefited greatly by incorporating these advances into many measurement and other devices. This has been done in a relatively unstructured manner with many devices being developed in isolation and in a way that precludes communication both between themselves and with hospital information and data management systems. The potential advantages of such communication are becoming more and more obvious. For this reason, nowadays more than ever, there is an increasing need for the definition of a standard for file exchange format which, when implemented by many manufacturers, solves the data interchange problem. There is a pressing need for technical standardization and the development of protocols to enable such communication to exist in an easy and open way, with subsequent clinical, administrative and research benefits. The proposed chapter aims to provide an –as-exhaustive-as-possible discussion on the aforementioned issues, as well as pinpoint other important issues in the field of homecare, such as legal and safety issues which are worth of consideration. It aims to highlight some elemental performance issues of the Wireless Personal Area Networks (WPAN) based on the current literature, and discuss upon the pros and cons of the proposed network architectures proposed. In addition, it aims to initiate some brainstorming as regards how many protocols we actually need, presenting the strong and weak points of most of the current interoperability standards utilized in the field of homecare. Emphasis is given on the encoding and formatting of ECG waveforms – being the most common type of biosignal analysed for most of the chronic diseases –, as well as providing a comparison between them based upon their applicability for homecare scenarios.